Beginning with a picture of the Christian’s spiritual battlefield, onward to the Bible’s depiction of a Godly soldier all the way through to that holy victory that overcomes the world, this book carefully explains why the Christian believer must stand up for Christ and fight the good fight of faith. It explains not only why we must fight but why we must stand and fight together as one Body in Christ, in accordance to the commands of Christ. 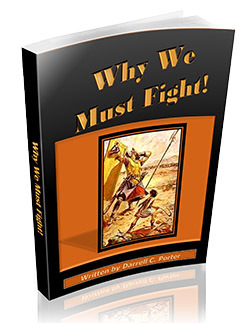 For those seeking to understand the rationale for spiritual warfare this book will provide solid Biblical evidence and clear and logical reasons and uplifting spiritual support as to “Why We Must Fight!”.